The powers-that-be at DC Comics are terraforming their fictional landscape yet again. Let’s take a look at exactly what’s transforming. Released on May 25, DC Universe: Rebirth #1 is both an editorial mission statement and the pebble drop that’s creating ripples throughout the publisher’s multiverse. Some of the status quo changes coming to DC will be big, continuity-shifting revelations; others will be smaller adjustments to tone and relationships. 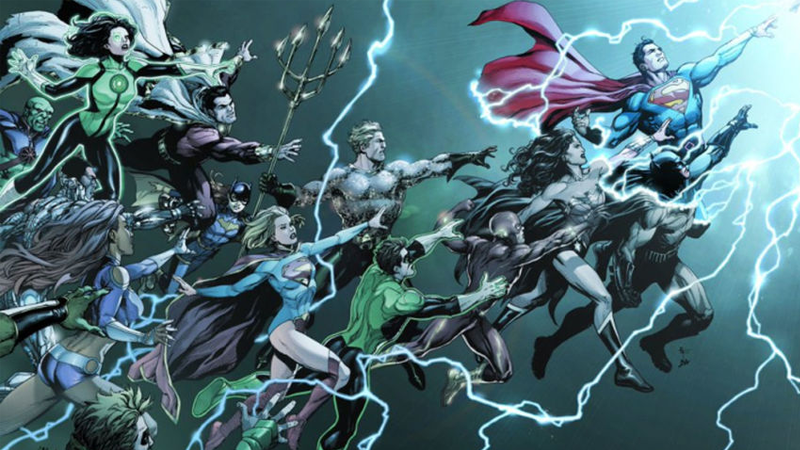 DC’s attempting a tricky thing with their Rebirth initiative: it’s an effort to restore the best parts of their decades-long history into a largely unpopular, five-year-old reboot. The official line is that they’re aiming to brighten a thematically bleak enterprise with infusions of affection, optimism ,and generational legacy. Over the next few weeks, we’ll be going through the relaunch of DC’s mainline superhero books status to catalogue the big and small tweaks that are being made. Come back for updates every Thursday. This is why Lex Luthor wants to be a Superman. We’ve already seen Lex Luthor flying around above Metropolis calling himself Superman and wearing an S-shield. This week, we finally find out why he’s doing it. Justice League #52 shows the billionaire schemer reckoning with the situation on Earth after the Darkseid War and the death of the New 52 Superman. Lex comes back to Earth from Apokolips for one reason: to try and revive his comatose sister Lena—rendered unresponsive by her connection to a Mother Box—with his own version of the Apokoliptian technology. Frustrated by failure, he pledges to become somebody Lena can be proud of. A Superman. Oh and he buys the Daily Planet just so he can yank Superman’s cape from the newspaper’s Man of Steel memorial and put on his shoulders. Nice touch, that. Wonder Woman can’t find Paradise Island. In Wonder Woman: Rebirth, the Amazon Princess used her magic lasso on herself to try and make sense of the inconsistencies of her personal backstory. Her search for answers led her to discover that Olympus is gone. Wonder Woman #1’s plot has Diana journeying to a war-torn country in search of more answers. Her ex-boyfriend Steve Trevor is there, too, under orders from Etta Candy, now a big deal muckety-muck in charge of a government military organization. The fact that the former lovers are in the same place is apparently some kind of coincidence. The issue ends by revealing Diana’s been searching for the Cheetah. Wonder Woman needs the help of her former confidant—once an archeologist called Barbara Ann Minerva—to help find Themyscira. There’s an army invading Gotham City and they all look like Bat-Wannabes. We’ve already seen the team that the Dark Knight and Batwoman are training to investigate the attacks against vigilantes in Gotham City. Detective Comics #935 shows us who they’ll be fighting. One of the issue’s reveals is the Belfry, a new Batcave-style base of operations right in the heart of Gotham. Holy 1970s flashback to Wayne Tower, Batman! The Belfry was designed by Tim Drake, who, it turns out, isn’t all that sure he even wants to be Red Robin anymore. Batman gets snuck up on by a convoy from the Colony—the name of the paramilitary threat advancing on the city is uttered in this issue—and it seems their technology makes WayneTech gear look as advanced as an Atari 2600. Batman better hope that his tech genius doesn’t quit. Other people are getting superspeed powers in the Flash’s hometown. The bulk of The Flash #1 has Barry Allen doing his typical routine of juggling crime scene investigations and high-speed superhero work. But, just as he’s trying his damnedest to be at two places at the same time, Barry’s police colleague August has something electrically familiar happen to him, with predictable results. Seems like there’s going to be a whole lot of Flash-ing going on in the coming months. Superman’s got some weird blue energy thing happening that looks very familiar. In Superman #1, the Kal-El from the pre-New 52 DC Universe visits the grave of his recently deceased predecessor to pay his respects. When he touches the ground before flying off, his hand leaves a glowing imprint and the baby blue hue is a very close match for the tones of Dr. Manhattan. Given that Superman was thinking about the ominous message delivered to him in DC Universe: Rebirth—about he and his family not being what they think they are—this is certainly a breadcrumb in the Watchmen-centered mystery at the heart of the DC Universe. Wally West is making people remember their lost history. The Kid Flash who took on his mentor’s identity has been the lynchpin of the Rebirth mystery. After having been stranded outside the timestream, Wally West is the only hero who knows that time has been stolen from the New 52 reality that started in 2011. Ever since he’s returned from his spacetime exile, the people he’s reconnected with have remembered who he is and their relationships with him. This week, in Titans: Rebirth, what’s seemed like a happenstance is written as a new, involuntary side effect power. Physical contact with his old friends generates sparks of energy that makes Wally’s friends remember shared moments from their lives. Wally thinks it’s the Speed Force but it’s also bluish in tone, though not quite the match for Dr. Manhattan’s energy signature as seen in Superman #1. The recently ended Titans Hunt series served as a precursor to the Rebirth mystery and this new development likely will be placing Wally and his teammates at the center of whatever happens next. It remains to be seen of this memory zap will work on people who Wally wasn’t close to. Still, given that part of the Rebirth mandate is to restore generational legacies to the DCU, we might see the Titans being an important part of re-establishing the classic DC heroic heritage. The notion that the JSA inspired the JLA who then begat the Teen Titans was a warmly regarded piece of lore from the pre-New 52 DCU. It just might be the Titans who bring it all together again. Green Lanterns #1 focuses on partners Jessica Cruz and Simon Baz, two human ring-wielders deputized to watch over Earth by Hal Jordan. Their first mission reveals a horrific crime scene that appears to have ties to the mythology of the rage-powered Red Lanterns. A bigger surprise comes after the two have gone back to their civilian lives; while meeting with his family and lawyer, Simon experiences seemingly prophetic visions that aren’t part of the usual Green Lantern power-set. It’s foreshadowing, of course, but this new twist might be a way of making Simon stand apart from the other Green Lanterns once the galactic peacekeeping corps is back at full strength. Some super-strong dude in a cape just saved Batman’s life. It’s not who you think, either. The main plotline in Batman #1 is concerned with the Dark Knight’s attempt to stop a catastrophe that will end thousands of lives. Just when it looks like Bruce is going to have to make the ultimate sacrifice (again! ), this guy shows up. The presence of a straight-up metahuman getting up in Batman’s face is a very different tack for a new set of Bat-stories. Usually, when heroes with Kryptonian-level powers horn in on Batman’s turf, he growls at them enough to shoo them away from staying too long. That probably isn’t going to work with a guy who’s ballsy enough to name himself after the whole dang city. Batman has assembled a weird team to fight a group of vigilante haters. Batwoman is going to have her hands full. Lex Luthor is playing Superman. In the wake of Superman’s death, Metropolis is without a guardian—that is, until Lex Luthor steps in, complete with power armor and Superman emblem on his chest. After publicly unveiling himself in the opening of Action Comics #957, Lex’s decision to take on the mantle drives the pre-Flashpoint Superman out of hiding (and, sadly, to shave his beard) and become the world’s Superman once more. The two brawl, and amidst the carnage the heist Luthor was attempting to foil reveals its real target: Doomsday, much to the concern of Superman (who naturally does not have the greatest history with the villain). Batman and Flash are investigating the Comedian’s button. The Flash: Rebirth is the only comic so far to actually pick back up with the major revelation of DC Rebirth #1, namely that the Watchmen are now part of the DC Universe. Set pretty much during DC Rebirth #1, this issue sees the Flash reunite with Wally West while investigating a new case that is uncannily like the death of his mother (and while getting weird visions of future doom from the Speedforce). It’s not much, but we get to see Barry and Bruce team up to try and research the Comedian’s badge, which came through when Wally first appeared in the Batcave in DC Rebirth #1. They don’t find much, other than the fact it’s doused in a radiation not even The Flash can recognize, but the duo are keeping their investigation between themselves for now. Clark Kent is mysteriously alive. During all the brawling with Lex and the New-Old Superman, Action Comics #957 throws another spanner in the works: Clark Kent is seemingly alive. Yes, the man who just melted to death (in disappointing fashion) as his alter-ego, the New 52 Superman. Is it really Clark? Does he still have superpowers? It doesn’t seem so, but whatever is happening, there are a lot of people who can claim the Super-mantle running around Metropolis at the moment. The kid who used to be an unofficial Robin is now Batman’s newest partner. Duke Thomas isn’t the new Boy Wonder. That’s a good thing, since there are too many Robins running around Gotham and the world. (As Red Robin, Tim Drake will be part of Batman’s team of crimefighters in Detective Comics, while Damien Wayne will be leading the Teen Titans in that series’ relaunch.) After running through Gotham’s streets with other teen vigilantes and figuring out that Bruce Wayne was Batman, Duke comes to Wayne Manor in Batman: Rebirth to see about a job offer from the crime-fighting billionaire. Duke doesn’t have a codename, isn’t biologically related to Bruce and has two parents that are alive, if unable to look after him. His employment-model sidekickery feels like an attempt to create a healthier kind of partnership for Batman. There’s a new kind of Power Ring in the cosmos. Hal Jordan, John Stewart and the other human members of the universe’s emerald peacekeeping corps are busy dealing with cosmic chaos far away from home. Green Lanterns #1 focuses on Simon Baz and Jessica Cruz, the new rookies assigned to protect the Earth. In the first issue’s opening spread, readers see an unaccounted-for Guardian running away from hostile aliens with a new ring weapon. The powerful blast from the unseen ring simultaneously emits every color in the emotional energy spectrum. Of course, the bad guys want it and it’s likely that the new all-in-one mood ring will be a focus of the Red Dawn event teased on the issue’s last page. Calendar Man is a whole lot creepier. Way back in the 1950s, Calendar Man was just a guy with a jaunty cowl, goofy costumes, and an oddly specific gimmick. He got re-imagined as a macabre serial killer in the last decade, thanks in large part to the Batman Arkham games. In Batman: Rebirth, King takes that chilling evolution even further, re-inventing Julian Day as a man who dies and gets reborn over and over again. Crawling back to life through his own shed skin? Time to forget you ever laughed at Calendar Man. The old Superman wants to bring back the dead Superman. Guess you’re stuck with the job, big guy. Green Arrow is a goatee-wearing Social Justice Warrior again. When the New 52 reboot hit in 2011, it recast Green Arrow as a cocky, clean-shaven techbro who used the resources of Apple-alike Queen Industries to fight crime. Green Arrow: Rebirth has Ollie investigating the disappearances of homeless Seattle-ites and nudges the character back to being the politically motivated super-bowman best known from an influential run of 1960s and 1970s comics. Dang, that’s harsh, Pretty Bird.